The appropriate selection and placement of plant materials in the landscape can significantly influence the amount of supplemental water that is required. The maximum use of low water use plants will optimize water savings. It is, however, not always desirable or appropriate to rely solely on the lowest water use plants. Many of the more exotic plants that have higher water requirements can be successfully grown in xeric settings if they are strategically placed. In fact, the built environment often drastically alters the natural environment to the point that many low water plants would not thrive. Consider the amount of runoff that occurs from a roof. Low water use plants located in areas where runoff from the roof increases the average soil moisture content will grow leggy and unhealthy. The root system may even rot in poorly drained areas where an exotic plant would be right at home. A good planting strategy is key to a successful xeriscape. Plants should always be grouped together based on their horticultural needs. If plants have special needs for sun, nutrients, water, or soil type, microclimates should be selected or modified to meet those needs. Placing plants in inappropriate locations will inevitably lead to plant stress. Stressed plants have less ability to fight off insects and diseases which will lead to a decline in their health and may result in an untimely death. There are numerous suitable xeriscape plants for every landscape in our area. These plants offer a wide range of colorful flowers, foliage, fruits, berries and interesting textures for all seasons. 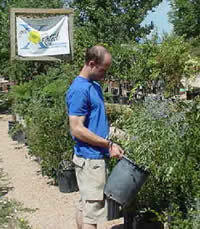 Local nurseries can guide you through plant selection for your particular landscape setting. Remember that the Four Corners region has elevation differences that will be a deciding factor in your plant selection. Always inform your nursery person at what elevation you will be planting. The use of larger hardscaped surfaces such as patios and walkways helps to create fire resistant buffers around your homesite. Avoid wooden decks. The use of an automated irrigation system will ensure that your plantings are watered appropriately and remain healthy, which will make them more fire resistant. Furthermore, an irrigation system can be operated in advance of a fire, enabling the landscape to hold more moisture and making it more resistant to ignition. 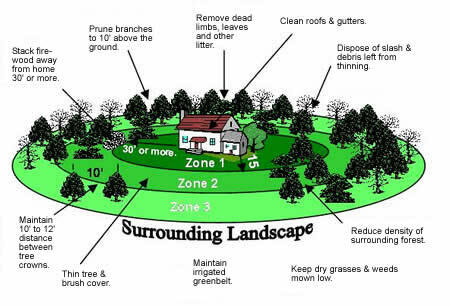 Thin out continuous tree cover to create defensible space within 30’ of your home. Prune branches to a height of 10’. Maintain and clean up flammable materials within 5’ of your house. Maintain a 10’ to 12’ spacing between tree crowns. Avoid planting evergreens near structures. Plants near your home should be more widely spaced and lower growing than those farther away. Plant in small irregular clusters or islands. Use mulches to conserve moisture and reduce weed growth. Fire does not spread readily in damp mulch.